I’ve been seeing recipes for quinoa soup everywhere lately, and well, since I adore quinoa, I knew I had to hop on that bandwagon. After all, quinoa is the protein-packed grain of the gods, at least in my household, and I was craving its nourishment. Needless to say, I was ready for a soup redemption. With all the possibilities, I couldn’t decide between making this an Italian or Mexican inspired quinoa soup. So I went with both. I wasn’t too worried how it’d turn out because anything would be better than the last can of tomatoes I was slurping from my spoon. I’m happy to say the results far exceeded my expectations, drawing on the best parts from both sides of this flavor fusion. 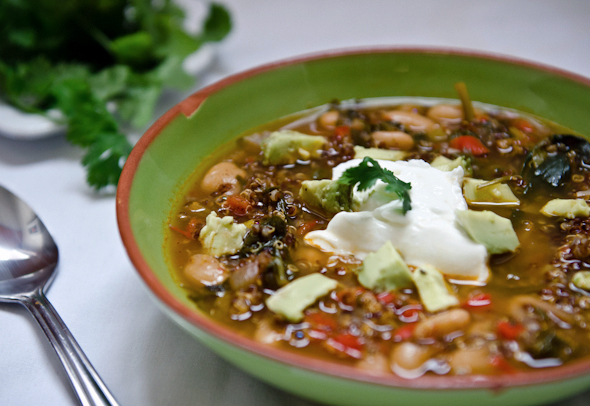 You’ve got all the veggies and grain base (with quiona replacing the pasta) from a typical minestrone soup, with all the rich flavor you’d get from the spices of a Mexican stew. Plus, it’s freshened up with a heavy dose of cilantro and topped with creamy avocado. Who doesn’t love foods topped with avocado? It was just the nourishment I needed and the perfect redemption we can all use now and then from a flop in the kitchen. In large saucepan, heat oil over medium-high. Saute onion, pepper, celery, and garlic, until veggies are tender and onion is translucent. Add spices and salt, and stir constantly for one minute. Add quinoa, tomatoes, entire contents of can of cannellini beans, and broth. Adjust heat to a simmer, and cook 30 minutes, or until quinoa is tender. Stir in cilantro and spinach, and cook until just wilted. Serve, topped with diced avocado and a dollop of yogurt, if desired. *May need to add more water/broth upon reheating. The Stars Are Doing Yoga…Are You? This sounds amazing – I was just thinking last night how I needed to find a new recipe for quinoa. I have so much of it! Thanks so much for this recipe! I look forward to trying it. Quinoa is such an amazing grain. This sounds fantastic! I love minestrone soup. I never would have thought to use quinoa instead of pasta. AND, the addition of cinnamon is right up my alley. I add it to anything with tomatoes, seriously! It just adds a very authentic, delicious flavor.